This is an update of a browser extension I last wrote about a couple years back. It's too good not to revisit every so often. Just the other day, this happened: After writing a fairly lengthy post in a browser-based blog tool, I hit the Backspace key to delete something--but because my cursor wasn't inside the text field at the time, Chrome interpreted that as the keyboard shortcut for "back." In other words, back to the previous page. A big chunk of my unsaved work: gone. This kind of thing can happen in all kinds of circumstances. Maybe you click Next or Save after completing a Web form, and your browser crashes, or the server times out, or your Internet connection croaks. Whatever the case, it means you just wasted a bunch of time and lost a bunch of work. 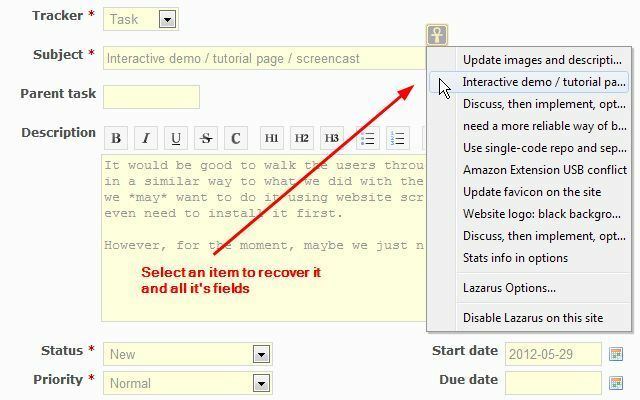 Lazarus automatically (and securely, with a password if you prefer) saves every keystroke you enter into any Web form, blog tool, comment box, or what have you. To bring back your data, just look for the little Lazarus symbol above whatever box you were typing in. Click it, then choose the snippet of text you want to recover. Presto! It reappears like magic. I can't count the number of times Lazarus has rescued me from accidental deletions, wayward keystrokes, and the like. If you use any of the supported browsers, this is a must-have extension.